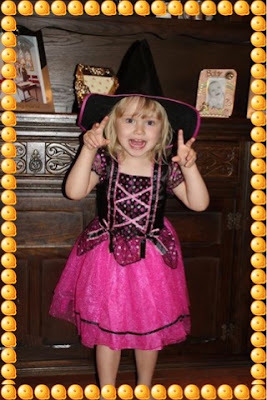 Life with Liv: Getting ready for Halloween! When the lovely Asda team got in touch to ask if Liv would like a Halloween outfit we happily agreed and eagerly awaited the parcel! Sadly with Liv being such a Giant the cute witches outfit that arrived didn't fit. Luckily it fits my beautiful Niece - who is the same age but definitely not the same size as Liv! Priced at a bargain £6 for the sparkly pink dress and pink trimmed witches hat, I think her trick or treat bag will soon be overflowing. 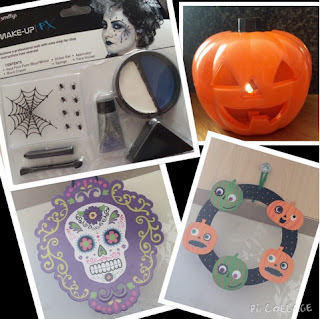 They were also kind enough to send some Facepaint complete with applicator, eyeliner, make up sponge, stick on spider web, spiders and glitter. They also included some really cute hanging decorations and a safety conscious battery operated light up pumpkin. Why not pop over and check out Asda's Halloween range yourself?